We had a really, really horrible experience with another contractor and were desperate to find someone who could fix the mess we were left with and stand behind it. 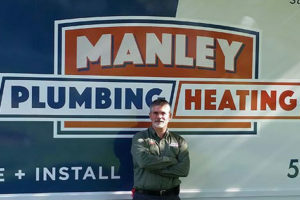 When we called Manley Plumbing & Heating, they came right out. We haven’t had any issues since they installed our new boiler. We have needed them for other things and every time we call they always come right out. With our Service Buddy membership we find it nice to have everything checked out two times a year so our plumbing is always reliable. We absolutely recommend Manley Plumbing & Heating and have already done so to others. I am very pleased with what the guys have done for me. I never know what’s going to happen next at my home but I always will call Manley Plumbing and Heating. I depend on them. They have been here anytime I have had problems, even on Sunday! They came in the middle of the night when I didn’t have heat. They always come thru for me. They met my daughter and granddaughters approval, you know they’ve done something right. I am glad I found Manley Plumbing & Heating because they know what they are doing and I feel comfortable with them. We can go away and not worry about what’s happening at home. When they installed a softener it improved our water quality. I don’t have to clean as much. I used to soak the showerheads in CLR every month; things are cleaner and easier to take care of now. I should have had them install the water equipment twenty years ago! I am very happy; they never leave a mess and are very nice to deal with. Besides the softener they have done sump pumps, faucet repairs and replacements, toilet stoppages, boiler replacment and we will be using them for our boiler service too. I’m glad we finally found someone we can trust. Although the price sometimes makes me cringe, I know it will be done right and I don’t have to worry. That’s important to me. We have used Manley Plumbing & Heating ever since 2005. During this period we have been more than satisfied with both service and rates. They give excellent service are experienced, dependable, reliable, very clean, great personality and explains plumbing and heating in layman terms, also keeps you updated on the latest plumbing and heating information. “My husband and I are more than satisfied with all the work that they has done for us. With the above qualifications in mind, we would not hesitate to recommend them to do your next project of any size. I liked the way you priced things. It was very respectful with no surprises. Fabulous job, very neat from start to finish. We will use you again. I ‘m pleased with the service. I was comforted to talk with others I know who have used them. They wear booties and uniforms. So when they came to my house I knew who was at the door. Not just any Joe Blow. The technician was a perfectionist, perfect! I wanted it done right. I will use them again. Thank you! We called, and once again you quickly responded. This time you saved our living room ceiling from total collapse. As always, you immediately found the problem (a leaking pipe above the ceiling) and had it quickly repaired. We so appreciate your professionalism, knowledge, neatness, and friendliness. Again, thank you for your extraordinary degree of competence. You saved us the cost of having to replace the entire ceiling. My wife and I have used Manley Plumbing & Heating for the past two years and are always impressed with how they always show up when they say. We never have any problems with their work. When a bad switch for the new furnace they installed for us failed, they took care of it and the warranty right away. When our old hot water tank failed, they were there again when we needed them, and even worked late to make sure we had hot water that night. I recommend All Service to everyone who wants great service. I liked the way they approached things. Very professional, helping me know my plumbing and heating systems, so I could make the right decision. I’m very happy with the service! Here at Manley Plumbing and Heating, we know that your home and family are important. You need someone you can trust and who’s available when you need them. When you have a plumbing or heating problem things can seem out of control. We come out quickly to fully evaluate the problem, show you all your options, give you a guaranteed price upfront and take care of things right then and there. Give us a call and let’s start a relationship that works for you, your family and your home.